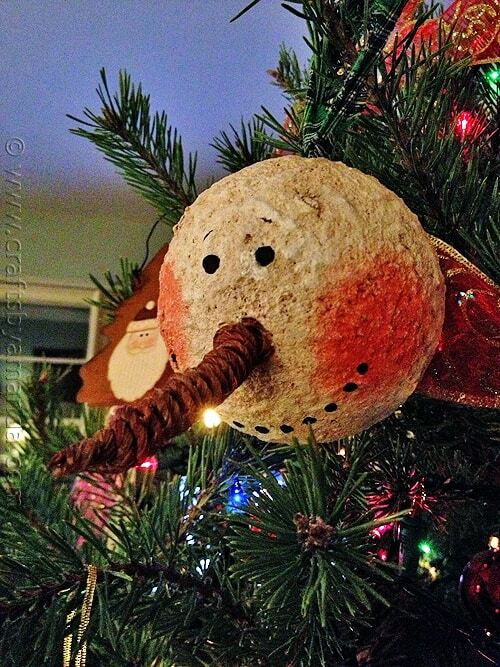 Make a big statement this Christmas with this jumbo ornament. 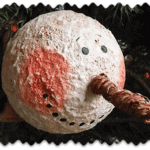 A big vintage snowman that is as big as the palm of your hand to grace your Christmas tree this year! I was actually inspired to make this because of an ornament I bought a couple of years ago. Problem was I made this ornament back in September, which of course meant I hadn’t unpacked my Christmas ornaments yet. Therefore I would have to make it from memory. Now that Christmas is here and the ornaments have been taken down from the attic, I think I did a pretty good job of replicating that big vintage snowman. You can get a feel for the size from these pictures. When I made this in September I took some pictures of him hanging in the tree outside and was glad to get him hung up in the Christmas tree finally. 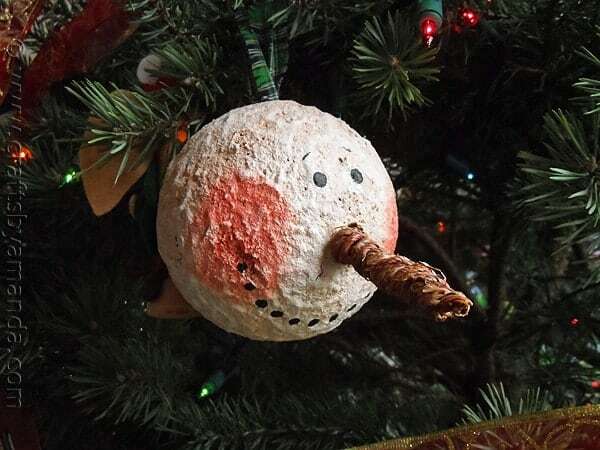 To make this ornament I used a 4-inch Styrofoam ball, Magikote, snow texture paint, white glitter paint, antiquing gel and a few other supplies. I used a chunk of floral foam as a stand to work with. After adding a coat of Magikote, I then added Snotex paint and texturized it with my fingers. It takes a while to dry. 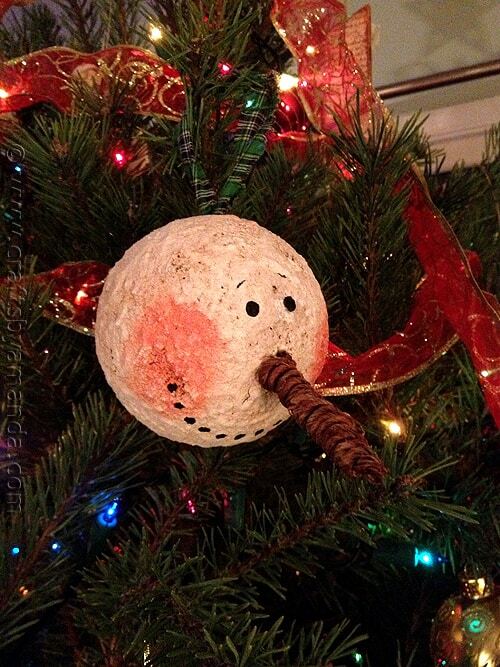 I used vine wrapped wire to make the nose by wrapping it around a pencil, then created a hole in the ball where the nose would be to create my starting point. From there I added cheeks with Coral Blush paint and used the handle end of a paintbrush to add the eyes and mouth with black paint. After that dried I mixed glazing medium with Light Cinnamon paint and brushed it on then wiped it back. I wasn’t really achieving the tint I wanted, so I switch to antiquing gel instead. 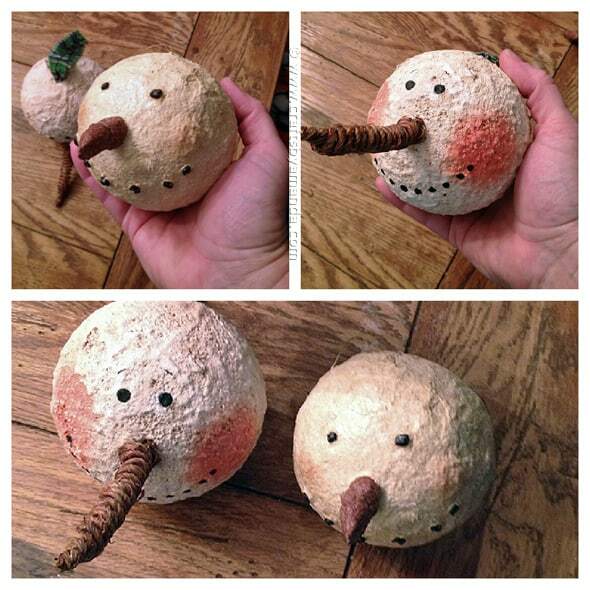 Insert dowel into Styrofoam ball. Insert the other end of the dowel into the floral foam. This will hold the ball for you while you work. 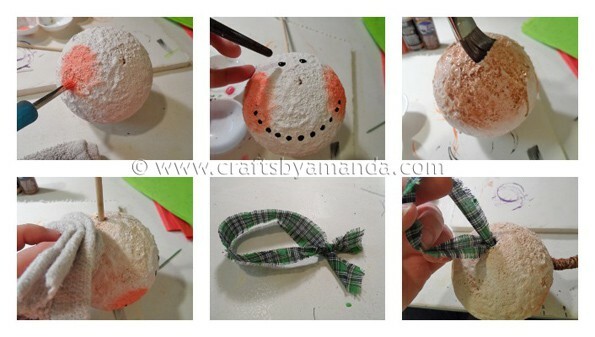 Coat the ball in white paint or Magikote and let it dry completely. Thin snow texture paint with white glitter paint. Simply squeeze some of the glitter paint into the texture paint and stir. Texture paint is usually quite thick and you will want it to have a more paintable texture. 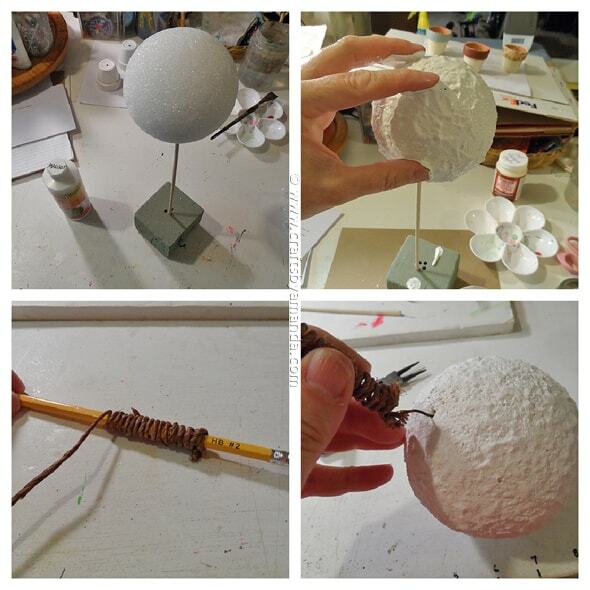 Apply the texture paint mixture all over the Styrofoam ball until completely covered. Use your fingers to add more texture by touching and lifting your fingers out of the paint. Allow to dry completely, overnight is best. To make the nose, coil some vine wrapped wire around a pencil. The nose will be about 3-inches long. Peel back some of the vine from the end of the nose and insert the wire into the ball. Remove the nose and set aside. The hole will mark where your nose will go. Dip a scruffy paintbrush in pink paint and dab off the excess onto a cloth or paper towel. Using a pouncing motion, apply pink to the cheek areas. Dip the handle end of a paintbrush into black paint to add eyes and mouth. Let the paint dry completely. 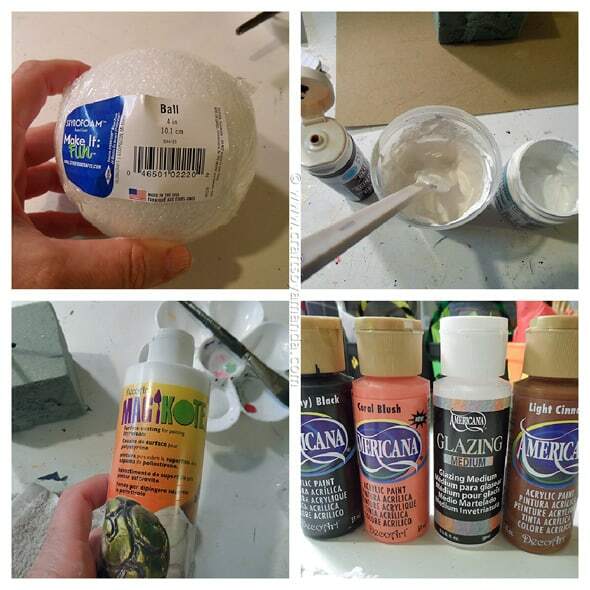 Mix the light brown paint with the glazing medium according to bottle directions. Apply all over the ball and wipe back excess with a clean cloth. Repeat until you are happy with the results. Create a hanger from a scrap of gingham fabric. Insert into the hole from the dowel and glue in place. Add a dab of glue to the nose hole and insert the nose. I make these as well however I use brown shoe polish wax to give it that aged look when paint is all dry. I use the kind that is in a small tin container not the bottled liquid kind. Just wanted to share that with ya. It gives them a real nice look also. I love the vine covered wire for the nose. Beats the custom orange felt nose…. LOVE, LOVE, LOVE IT! I am a big snowman collector so this will be added to my collection as soon as I get it made. THANKS for sharing..